The “Annual Golf Title” gives holders the right to play without charge on the following golf courses in Vilamoura: Pinhal Golf Course; Laguna Golf Course; and Millennium Golf Course. The “Annual Golf Title” gives holders the right to play on the following golf courses in Vilamoura, paying a discounted green-fee equivalent to 50% (fifty percent) of the standard course price: The Old Course; and Victoria Clube de Golfe. The present general conditions establish the terms and conditions of access and use by the said holder of the “Annual Golf Title”, provided by LUSORT, of the referred Title. 1. The “Annual Golf Title” offers the holder the right to play golf without charge when tee times are available and the round is booked 72 hours in advance, the use of the same should be in accordance with the rules of Lusotur Golf's, S.A., the company owning the golf courses. 2. The holders of a Title should be able to provide certified proof of handicap, issued by a Golf Club or Golf Federation. The maximum handicap allowed for Title holders to play on the Pinhal Golf Course, Laguna Golf Course and Millennium Golf Course is 36 for women and 28 for men. The maximum handicap allowed for Title holders to play on The Old Course and Victoria Clube de Golfe is 28 for women and 24 for men. 3. The holder agrees to the reasonable use of the Title and respective golf courses open to Title use, as well as to accept full responsibility for any eventual damage caused, directly or indirectly, in the use of the same. 4. In the event of misuse of the Title, in contravenance with course rules, LUSORT reserves the right, alternatively or cumulatively, to suspend the Title with immediate effect, whether through its own decision, or at the behest of a third party. 5. LUSORT is not responsible for any suspension, interruption, or obstruction to access or use of golf courses, which result from the fulfilment of legal or administrative decisions, or Acts of God, including fires, power cuts, wars, riots, earthquakes, floods, and other natural disasters, strikes, technical failures, as well as interdiction of the golf courses, by the owning company Lusotur Golf's, or any other facts of such seriousness to impede the normal operation of facilities. 6. For access to this promotion it is both indispensable and compulsory to supply personal details for purposes of the referred promotion. The above mentioned details are processed and stored electronically, for use in marketing and telemarketing campaigns of LUSORT products and services and those of associate companies. 7. The holder is guaranteed the right to access his/her details and the respective rectification, within the terms of Portuguese Law 67/98, enacted October 26, 1998. All computerised files are the responsibility of Alconru, Sociedade de Construção e Promoção Imobiliária S.A., contactable at its head office located in the Rua da Cássias, Edf. 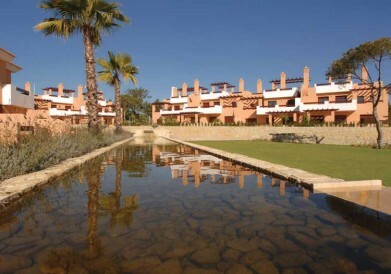 Los Arcos, Vilamoura, 8125 – 466 Quarteira, and by telephone number 351 289 310 900. 8. The holder authorises the processing of collected personal details in accordance with the purposes and conditions described above.